This Ceilidh Band has a core line up of violin, accordion and guitar augmented by either drums or keyboards (subject to availability) and their repertoire crosses many musical styles whilst maintaining a traditional sound. Though they produce an amazingly full sound as three musicians,the extra dimension of a fourth musician gives a really big band sound. The violin takes the lead whilst the accordionist's right keyboard plays chords and harmony parts. The accordionist's left hand buttons give a rich deep bass. The guitar blends with both instruments adding exciting and creative improvisations,plus the dynamic use of a midi interface on the guitar adding brass arrangements and other instruments to the overall sound. The music really does come alive. 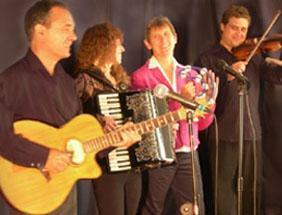 Sue,the ceilidh band's resident caller,has a wealth of experience calling dances at all types of events. She is friendly and humorous. Her instructions are quick, clear and simple so everyone can be up and dancing with ease. She regularly calls dances at weddings, schools, parties and other special occasions. The emphasis is always on fun and enjoyment. Everyone has a ball. Some of your guests may never have been to one of these dances, no problem. Sue will have them up and dancing, laughing and having fun in no time at all.